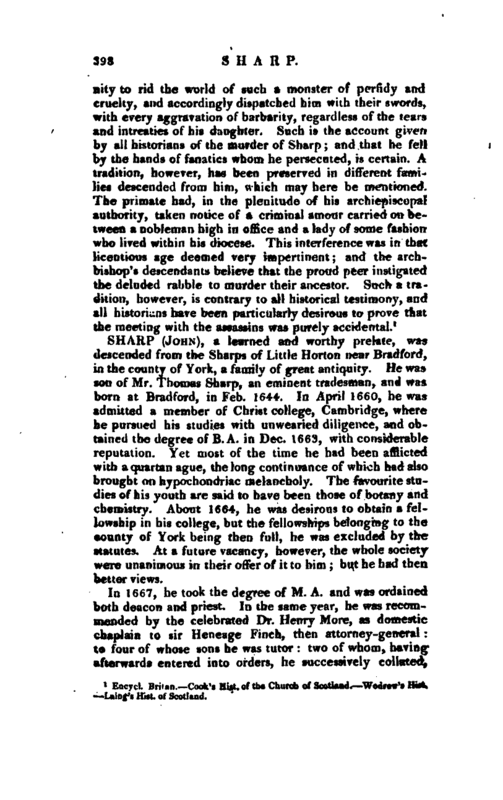 , a learned and worthy prelate, was descended from the Sharps of Little Horton near Bradford, in the county of York, a family of great antiquity. He was son of Mr. Thomas Sharp, an eminent tradesman, and was born at Bradford, in Feb. 1644. In April 1660, he was admitted a member of Christ college, Cambridge, where he pursued his studies with unwearied diligence, and obtained the degree of B. A. in Dec. 1663, with considerable reputation. Yet most of the time he had been afflicted with a quartan ague, the long continuance of which had also brought on hypochondriac melancholy. The favourite studies of his youth are said to have been those of botany and chemistry. 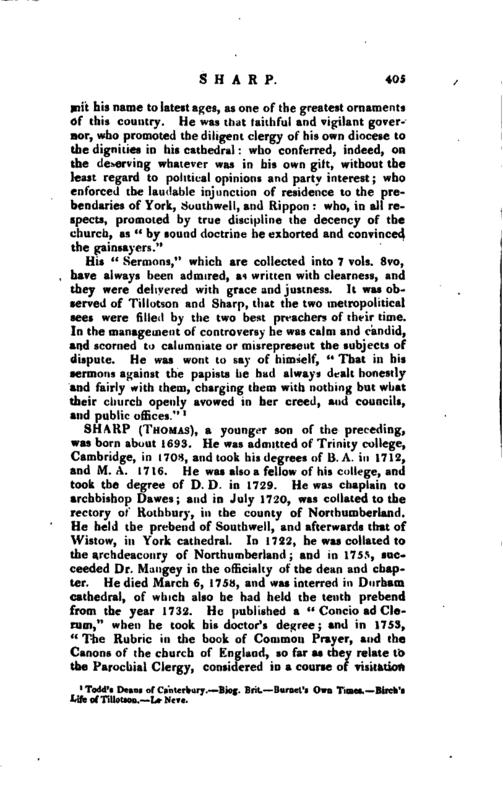 About 1664, he was desirous to obtain a fellowship in his college, but the fellowships belonging to the county of York being then full, he was excluded by the statutes. At a future vacancy, however, the whole society were unanimous in their offer of it to him; but he had then better views. In 1667, he took the degree of M. A. and was ordained both deacon and priest. In the same year, he was recommended by the celebrated Dr. Henry More, as domestic chaplain to sir Heneage Finch, then attorney-general to four of whose sons he was tutor two of whom, having afterwards entered into orders, he successively collated, | when archbishop of York, to the rich prebend of Wetwang in his cathedral. At the opening of the Sheldonian theatre in July 1669, he was incorporated M. A. with several other Cambridge gentlemen, whom the fame of that intended solemnity had brought to Oxford. In 1672, sir Heneage Finch obtained for him from the king, the archdeaconry of Berkshire, vacant by the promotion of Dr. Mews to the see of Bath and Wells. In the same year, sir Heneage was appointed lord keeper of the great seal, when he gave an eminent proof of the confidence which he placed in the judgment and integrity of his chaplain. 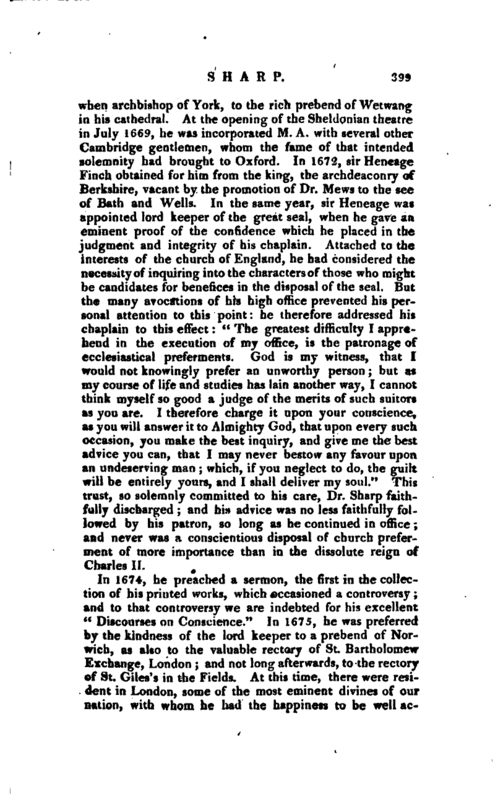 Attached to the interests of the church of England, he had considered the necessity of inquiring into the characters of those who might be candidates for benefices in the disposal of the seal. But the many avocations of his high office prevented his personal attention to this point: he therefore addressed his chaplain to this effect: “The greatest difficulty I apprehend in the execution of my office, is the patronage of ecclesiastical preferments. God is my witness, that I would not knowingly prefer an unworthy person; but as my course of life and studies has lain another way, I cannot think myself so good a judge of the merits of such suitors as you are. I therefore charge it upon your conscience, as you will answer it to Almighty God, that upon every such occasion, you make the best inquiry, and give me the best advice you can, that I may never bestow any favour upon an undeserving man; which, if you neglect to do, the guilt will be entirely yours, and I shall deliver my soul.” This trust, so solemnly committed to his care, Dr. Sharp faithfully discharged and his advice was no less faithfully followed by his patron, so long as he continued in office and never was a conscientious disposal of church preferment of more importance than in the dissolute reign of Charles II. In 1674, he preached a sermon, the first in the collection of his printed works, which occasioned a controversy; and to that controversy we are indebted for his excellent “Discourses on Conscience.” In 1675, he was preferred by the kindness of the lord keeper to a prebend of Norwich, as also to the valuable rectory of St. Bartholomew Exchange, London; and not long afterwards, to the rectory of St. Giles’s in the Fields. At this time, there were resident in London, some of the most eminent divines of our nation, with whom he had the happiness to be well | acquainted. Tillotson and Clagett were his more particular friends: his connection with Tillotson had commenced early in life, and to Clagett he was attached by a similarity of manners, of study, and of inclination. On the death of Ciagett, he published a volume of his sermons, to which he prefixed an account of his worthy friend. (See William Clagett.) In 1679, he took the degree of D.D. in which year he had accepted the lectureship at St. Laurence Jury, which he resigned in 1683. In 1681, he was promoted by the interest of his former patron, now lord high chancellor, to the deanery of Norwich. 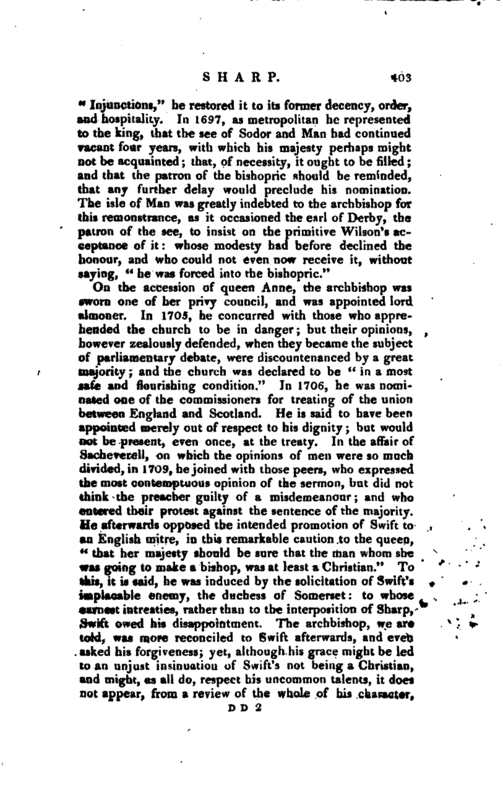 Upon the death of Charles II. he drew up the address of the grand jury for the city of London. He had been chaplain to that monarch, as he was also to his infatuated successor. In the reign of James, he was one of those distinguished preachers, who vindicated with boldness the reformed religion, and exposed with success the errors of popery. On May 2, 1686, he delivered in his church of St. Giles’s, a memorable discourse, in which he expressed a contempt of those who could be converted by any arguments in favour of the Romish faith. It was therefore considered as a reflection not only upon those courtiers who had conformed to that religion, but even upon the king himself; and he accordingly experienced the resentment of James and his party. On June 17 following, a mandate was issued to Compton, bishop of London, to suspend the obnoxious preacher; but Compton was too firm to the protestant interest to obey so tyrannical a command. He wrote a letter to lord Sunderlaud, which he requested might be communicated to the king. In this letter, he said “that the only power he had over Sharp, was as his judge; and that he could not in that capacity condemn him, without the forms of law.” He added, " Sharp was so willing to give his majesty all reasonable satisfaction, that he made him the bearer of the letter/' But to this no answer was returned, nor was Sharp admitted. The bishop therefore recommended Sharp to desist from the exercise of his function: and prevailed on him to write a petition to the king, in which he expressed his sorrow for constructions that were offensive, and promised to be more guarded for the future. But the petition was not admitted to be read. It had been resolved indeed to humiliate Compton, as well as to punish Sharp. For, because the mild prelate refused to condemn him uncited, unheard, undefended, untried, he | was himself suspended by that ecclesiastical commission, which suspended also Sharp; and was another example of the vengeance which arbitrary power determined to execute on those who had the courage to oppose it. 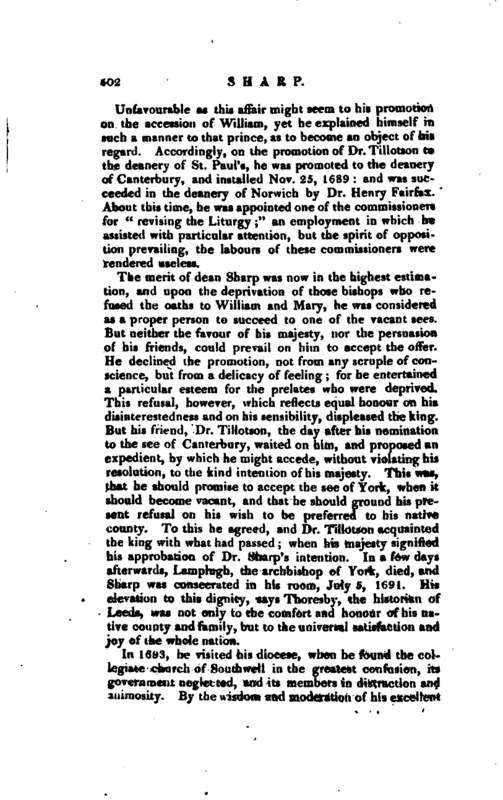 Dr. Sharp, during his suspension, resided at his deanery at Norwich. He there amused his leisure hours in collecting coins, of which, as well British, Saxon, and English, as Greek and Roman, he then and afterwards amassed sufficient to furnish a choice and valuable cabinet. 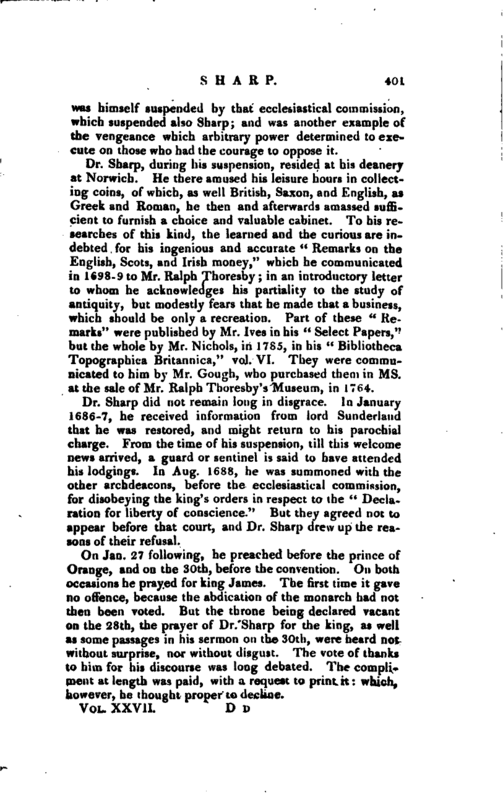 To his researches of this kind, the learned and the curious are indebted for his ingenious and accurate “Remarks on the English, Scots, and Irish money,” which he communicated in 16.98-9 to Mr. Ralph Thoresby; in an introductory letter to whom he acknowledges his partiality to the study of antiquity, but modestly fears that he made that a business, which should be only a recreation. Part of these “Remarks” were published by Mr. Ives in his “Select Papers,” but the whole by Mr. Nichols, in 1785, in his “Bibliotheca Topographica Britannica,” vol. VI. They were communicated to him by Mr. Gough, who purchased them in ms. at the sale of Mr. Ralph Thoresby’s Museum, in 1764. Dr. Sharp did not remain long in disgrace. In January 1686-7, he received information from lord Sunderland that he was restored, and might return to his parochial charge. From the time of his suspension, till this welcome news arrived, a guard or sentinel is said to have attended hi* lodgings. In Aug. 1688, he was summoned with the other archdeacons, before the ecclesiastical commission, for disobeying the king’s orders in respect to the “Declaration for liberty of conscience.” But they agreed not to appear before that court, and Dr. Sharp drew up the reasons of their refusal. On Jan. 27 following, he preached before the prince of Orange, and on the 30th, before the convention. On botii occasions he prayed for king James. The first time it gave no offence, because the abdication of the monarch had not then been voted. But the throne being declared vacant on the 28th, the prayer of Dr. Sharp for the king, as well as some passages in his sermon on the 30th, were heard not without surprise, nor without disgust. The vote of thanks to him for his discourse was long debated. The compliment at length was paid, with a request to print it: which, however, he thought proper to decline. | Unfavourable as this affair might seem to his promotion on the accession of William, yet he explained himself in such a manner to that prince, as to become an object of his regard. Accordingly, on the promotion of Dr. Tillotson to the deanery of St. Paul’s, he was promoted to the deanery of Canterbury, and installed Nov. 25, 1689: and was succeeded in the deanery of Norwich by Dr. Henry Fairfax. About this time, he was appointed one of the commissioners for “revising the Liturgy;” an employment in which he assisted with particular attention, but the spirit of opposition prevailing, the labours of these commissioners were rendered useless. 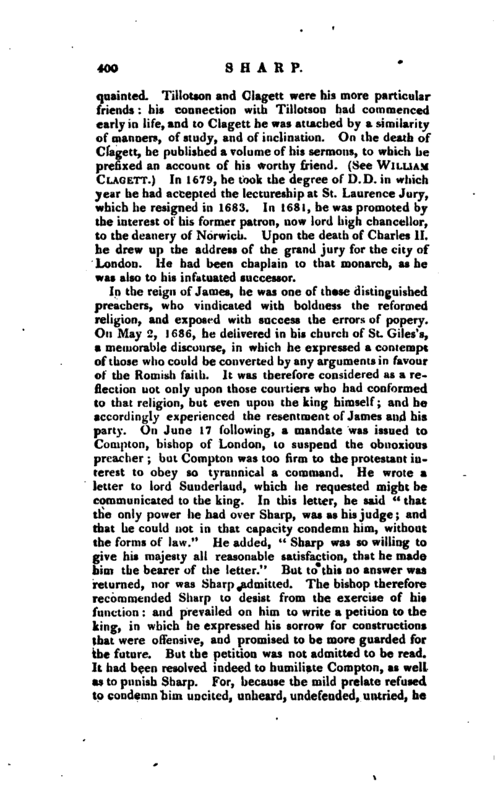 The merit of dean Sharp was now in the highest estimation, and upon the deprivation of those bishops who refused the oaths to William and Mary, he was considered as a proper person to succeed to one of the vacant sees. But neither the favour of his majesty, nor the persuasion of his friends, could prevail on him Ho accept the offer. He declined the promotion, not from any scruple of conscience, but from a delicacy of feeling; for he entertained a particular esteem for the prelates who were deprived. This refusal, however, which reflects equal honour on his disinterestedness and on his sensibility, displeased the king. But his friend, Dr. Tillotson, the day after his nomination to the see of Canterbury, waited on him, and proposed an expedient, by which he might accede, without violating his resolution, to the kind intention of his majesty. This was, that he should promise to accept the see of York, when it should become vacant, and that he should ground his present refusal on his wish to be preferred to his native county. To this he agreed, and Dr. Tillotson acquainted the king with what had passed; when his majesty signified his approbation of Dr. Sharp’s intention. In a few days afterwards, Lamplugh, the archbishop of York, died, and Sharp was consecrated in his room, July 5, 1691. His elevation to this dignity, says Thoresby, the historian of Leeds, was not only to the comfort and honour of his native county and family, but to the universal satisfaction and joy of the whole nation. Archbishop Sharp took offence at the very unbecoming way in which many grave points of doctrine and discipline are handled in Swift’s “Tale of a Tub.” Concerning this, a very in­ genious letter appeared in the —Gent, Mag. for 1814, p. 20, by which it would appear that a passage in a tract of our prelate against popery suggested to Swift the plan or outline of this satire. In 1712, archbishop Sharp perceived his health to decline, and was recommended to try the benefit of the Bath waters, but his recovery soon appeared hopeless. Not long before his death, he procured sir William Dawes to be appointed his successor, merely from his good opinion of him, “that he would be diligent in executing the duties of his office.” In the reign of queen Anne, the greatest attention was always paid to his recommendation, and in that of William, also, he had been joined with several other disinterested prelates, in a commission from his majesty, “to recommend deserving clergymen for the crown-preferments.” Among the many distinguished divines who, on rarious occasions, had been indebted to his interest, were his particular friend Tillotson, the bishops Bull, Beveridge, Wilson, Potter, and Gibson; Dr. Prideaux, though he himself thought otherwise, and Dr. Mills. He died at Bath, Feb. 2, 1713-14, in the sixty-ninth year of his age. His remains were removed to York, and interred privately in the cathedral on the 16th following, where a marble monument of the Corinthian order, was afterwards placed to his memory, with an elegant Latin inscription by bishop Smalridge, one of his intimate friends. Archbishop Sharp had married, in 1676, Elizabeth, the youngest daughter of William Palmer, of Winthorp, in the county of Lincoln, esq. by whom he had issue. His eldest son, John Sharp, esq. 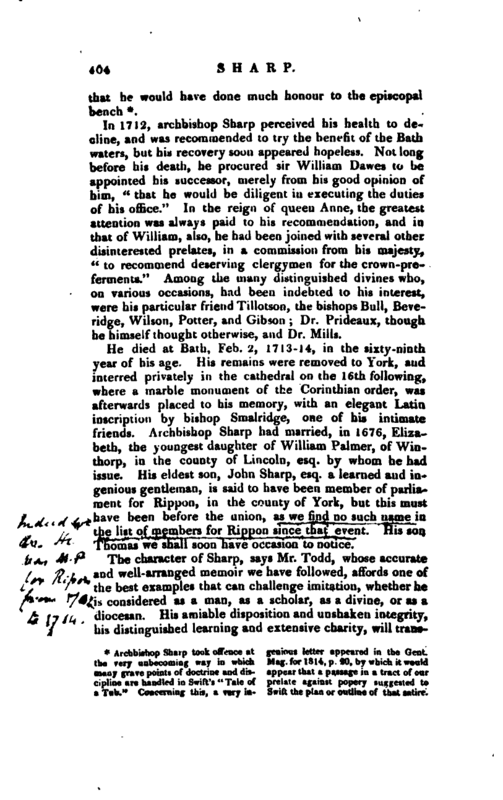 a learned and ingenious gentleman, is said to have been member of parliament for Rippon, in the county of York, but this must have been before the union, as we find no such name in the list of members for Rippon since that event. His son Thomas we shall soon have occasion to notice. 1 Todd’s Deans of Canterbury. Biog. Brit. Burntt’s Own Tinees. Birch’s life of Tillotson. Le Neve.